Would you go to British Tobacco for education on how to have healthy lungs? Would you trust the Sugar Industry for education on healthy teeth? So why on earth are we letting the nuclear industry run the education on the most important aspects of nuclear power – the ones that affect humans, all species, and the environment? But don’t let them be the education authorities on ionising radiation – a cause of cancer, birth defects, genetic effects, environmental effects. Don’t let them be the education authorities on dealing with climate change. Don’t let them be the education authorities on prevention of war. 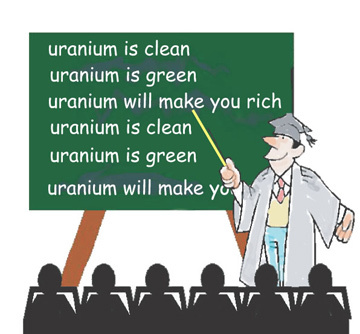 Don’t let them be the education authorities on the supposed economic benefits of nuclear power. Above all, don’t let the nuclear industry control education about HISTORY – about the bombing of Hiroshima and Nagasaki, atomic testing, about Urals disaster 1957, Mayak, Three Mile Island, Church Rock, Chernobyl, Fukushima……. And don’t let them get at our kids with their propaganda. “Will your next hard disk be made of a uranium compound? A team of scientists has discovered the first robust example of a new type of magnet — one that holds promise for enhancing the performance of data storage technologies: a “singlet-based” magnet made of the antiferromagnetic dipnictide USb2. I’ve been seeing a bit about “recycling” or “repurposing” radioactive materials lately. Reminds me of the in-silico (make s@#$ up!) studies that reporpuse diabetes drugs, opiates, etc for like, brain cancer. Ah well, I’m reminded of why ENEnews disappeared. I don’t understand. What is the connection? This is as good as it gets for information about world nuclear madness. No one is paid to do it. Than you to Beyond Nuclear. Thank you to GreenPeace. Thank you to the Green parties in Austria, England, America, Australia, Germany , France who have fought so hard to close down reactors so that more Fukushimas from happening. They have fought for 50 years. Thanks to them for keeping nuclear waste from being dumped on all of us by our governments . Thanks for helping to keep so much nuclear waste directly out of our communities and close to our homes so that many of our children, can have some chance of living for a while. The evil creep does not give a darn about ending the nuclear arms race or closing any nuclear reactors in country, Japan America or Canada. It does not care whether nuclear waste is sequestered properly. Not sure why that person went after US Senator Markey. Maybe because he’s the only one who has been constantly against nuclear power? He also helped to expose use of Americans as guinea pigs. The Green New Deal document being circulated is specific that it excludes nuclear. While I am commenting, I love your post, Christina – as always. That person goes after many grass-roots anti-nuclear groups. Mexico for petitions and current information about Dangerous Nuclear Waste Dumps and reactors. That person works against us. Some of the wingnuts from that group, have threatened us and hindered efforts to create accountability for dangerous nuclear waste stored at Hanford, in New Mexico and Texas. It is just an abomination. It is bad enough dealing with crooked-corrupt Government agencies and politicians and, then This menacing whackjob compounds the difficulty. I would be very Leary of anything from National Geographic at this time. They are very pronuclear.